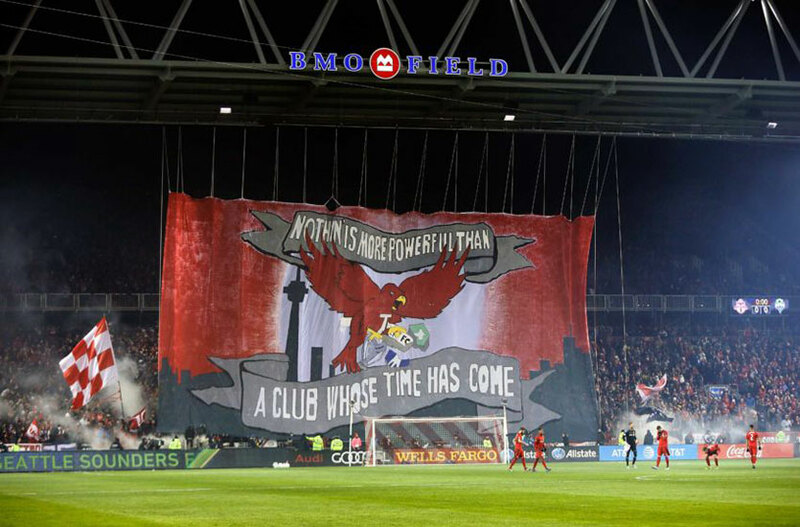 Shown in the image to the right at Toronto's BMO field, the Toronto FS's banner is hung from the winch system which Scenework installed in 2016. 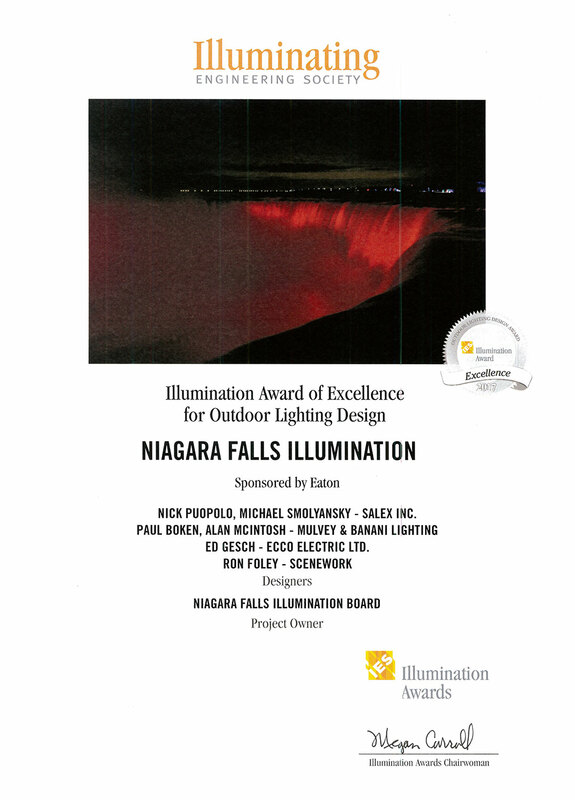 We're thrilled with our participation in the recent upgrade and enhancement of the lighting of the Niagara Falls! The project, which features cutting-edge LED technology, is the first upgrade in over 20 years. 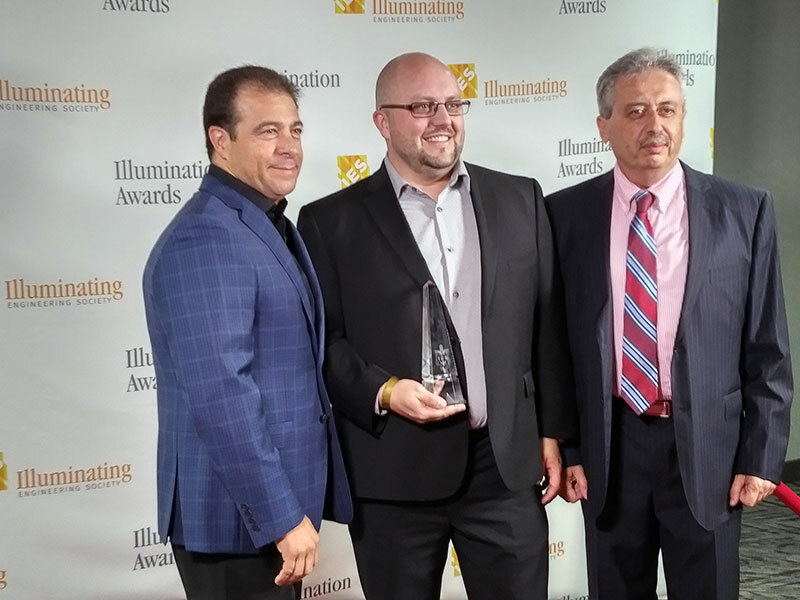 The Niagara Falls Illumination Enhancement Team, spearheaded by Salex president Nick Puopolo, is comprised of several prominent lighting and construction industry leaders. The team represents local, Canadian and American companies on this international endeavour, and includes: Michael Smolyansky, Applications Manager, Salex; Paul Boken, VP and Alan McIntosh, Senior Designer of Mulvey & Banani Lighting; Ed Gesch, President of ECCO Electric; Ron Foley, Scenework; and LED lighting products manufactured by Stanley Electric. The new solution dramatically improves the visitor experience by boosting the average lighting levels by up to three times and sufficiently improving the lighting's overall uniformity. The new lighting system allows for a universal control protocol, creating endless possibilities when it comes to scalability of the system. The integration of custom user interfaces also provides the ability for the public to interact with what is projected onto the Falls. In addition, the new lighting helps reduce the Falls' current energy consumption by 60 per cent! The newly installed lights were unveiled to the public on the evening of December 1st, 2016. 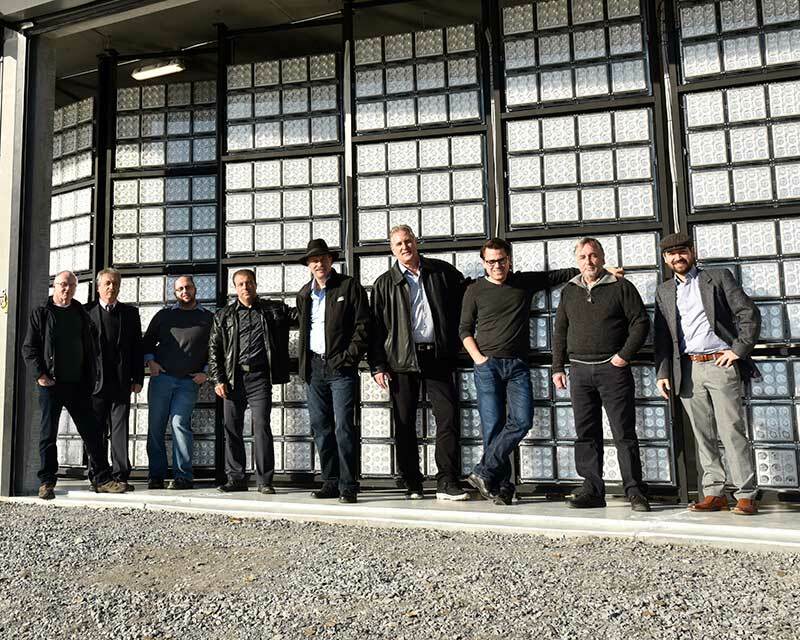 Comprised of several prominent lighting and construction industry leaders, the team represents local, Canadian and American companies on this international endeavor. NiagaraThisWeek.com → 'Frozen' falls capture imagination around globe. Spearheaded by Salex president, Nick Puopolo, who is a Lighting Certified professional (LC) with 32 years of lighting experience. Together, with Ecco Electric Ltd, the two firms presented a modern lighting solution to the Niagara Falls Illumination Board. The proposal replaced the existing illumination system with the latest in LED technology. Salex - one of Canada's largest lighting and controls sales agencies - represents over 60 Canadian, American and European architectural lighting brands. The firm has worked on many award-winning projects and is recognized as Southern Ontario's leader in facilitating effective and sustainable commercial lighting solutions. Salex applications manager, Michael Smolyansky, P. Eng., LC, LEED AP, joined Nick Puopolo on the project. International award winning Lighting Design consultancy, Mulvey & Banani Lighting (MBL) a subsidiary of Mulvey & Banani International Inc. (MBII) is represented by vice president Paul Boken and senior designer Alan McIntosh. The MBL team is comprised of dedicated and creative professionals with varied industry experience which inspire their design philosophy and approach. The team stays on the leading edge of lighting technology and design software tools through perpetual training, study and collaboration. ECCO Electric Ltd. is a St. Catharines-based electrical construction firm with substantial experience working on large scale projects in and around Niagara Falls, including the Niagara Parks Commission. Ecco Electric presented the bid for this project and was represented by its president Ed Gesch. 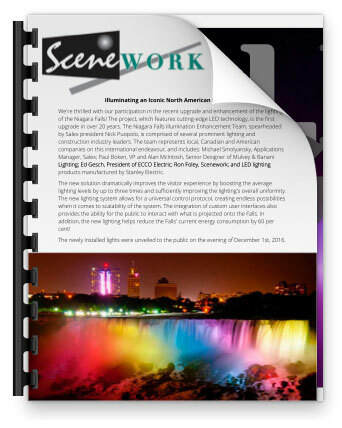 Scenework, represented by Ron Foley, is a leader in lighting installation, service and equipment supply with a specialty in servicing the theatrical, architectural and rigging industry. Stanley Electric Co., Ltd. is one of the world's largest manufacturers of LEDs and LED modules. The innovative lighting company creatively designs high reliability lighting products for automotive (headlights, taillights), electronics, and general lighting markets worldwide. Established in Japan in 1920, the Stanley Group employs over 15,000 people in 18 countries with their North American office located in Irvine, CA. Linus MacDonald, hired by the Illumination Board in 1995 as their lighting consultant, played a major role in the direction and quality control of the new Solid State LED lighting solution. 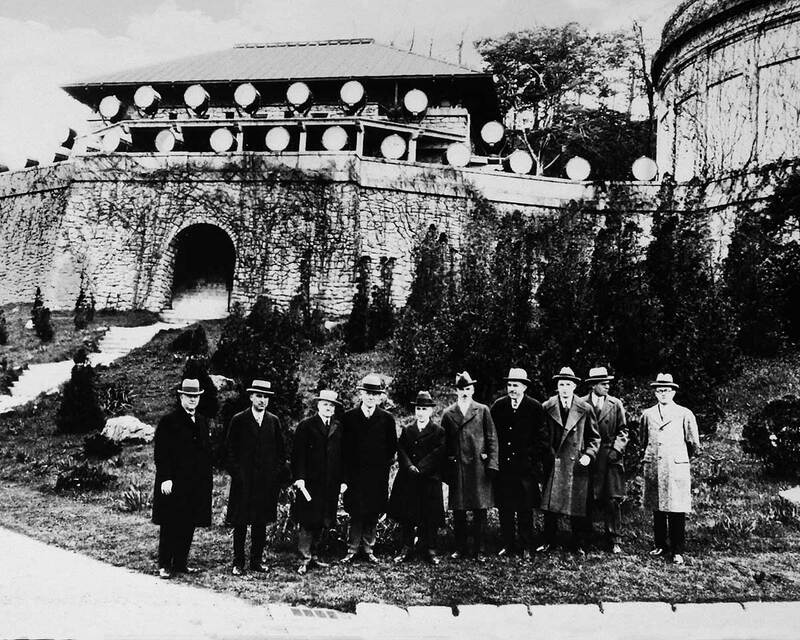 The first permanent installation of Twenty-Four Arc lights took place on February 24th 1925. These were replaced on June 20th 1958, with new Carbon Arc lamps fixtures. In the early 1970's the fixture were replaced once again utilizing a Xenon Gas lamps. This new system also included the first permanent coloured lighting solution. 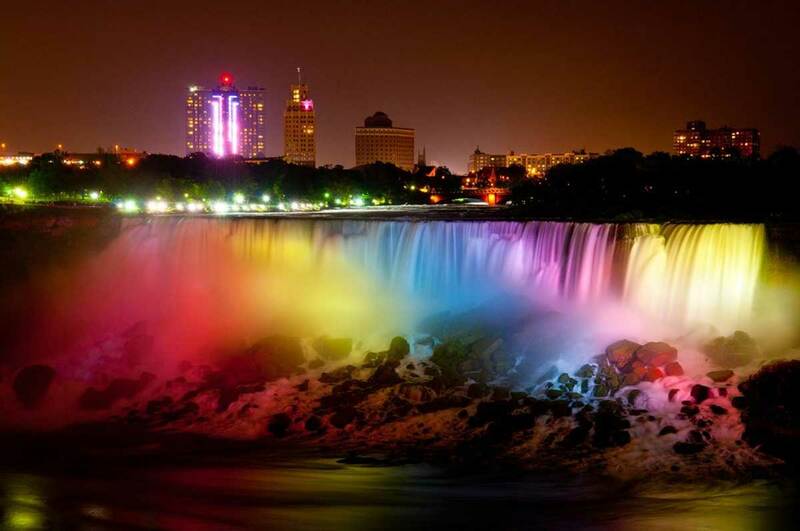 A blade colour controller was added which introduced combination of Red, Amber, Green and Blue light to Niagara Falls. In 1997 a newer more efficient Xenon lamps was installed in the existing fixtures to improve the performance. That lighting system only offered a total of 21 zones of control, 10 across the American Falls and 11 across the Canadian Falls, producing a total of 5 colour combinations. A new LED solution, unveiled on December 1, 2016, dramatically improved the visitor experience by boosting the average lighting levels 3 to 14 times the previous system, depending on the colors projected. The design also improved the overall uniformity by 75 times. Additionally, this maintenance-free solution reduced the Falls' energy consumption by 60 percent and the upgraded LEDs provided a minimum 25-year lifespan. The new system is comprised of very narrow beam, high intensity LED luminaires arranged in groupings. This grouped approach allows for precise light distribution, as each cluster is divided into adjustable quadrants improving the overall uniformity across the entire falls. The new LED lighting system provides a total of 350 zones of control, 120 across the American Falls and 230 across the Canadian Falls. Each control zone is equipped with separate Red, Green, Blue and White LED luminaires. A total of 1,400 individual luminaires are used and together provide the ability to produce up to 16,777,000 different colours combinations. The universal control protocol offers endless possibilities when it comes to scalability of the system. 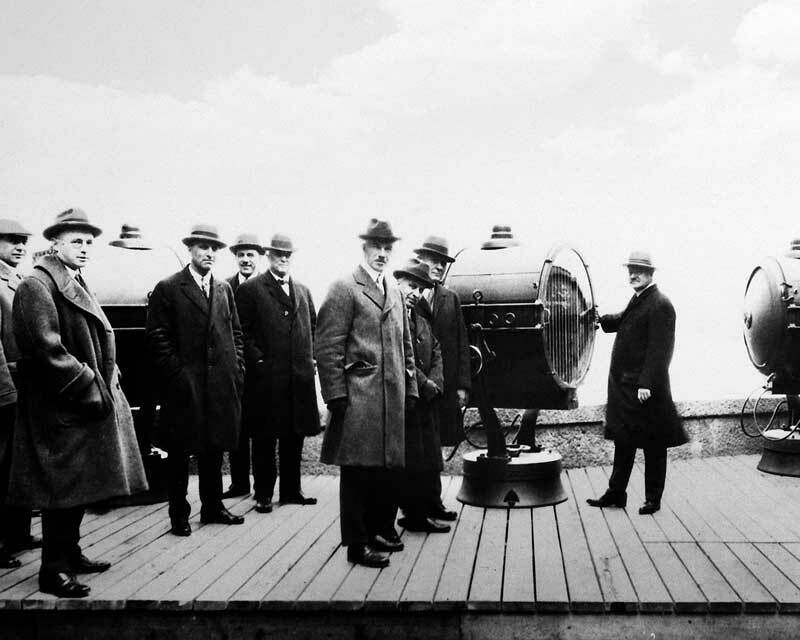 This provides the Niagara Falls Illumination Board the ability to astronomically schedule lighting scenes and synchronize the lighting with surrounding events, festivals and public attractions. The integration of a custom user interfaces also provides the ability for the public to interact with the experience and the illumination projected onto the falls. Hilton Hotel and Suites Niagara Falls Webcam → Streaming to you live 24 hours a day, 7 days a week, 365 days a year, from the 53rd floor of the Hilton Hotel and Suites is the Official Niagara Falls webcam. Niagara Falls Webcam → Earthcam's webcam streaming to you live 24 hours a day, 7 days a week, 365 days a year. Daily Planet → Niagara Falls LED lighting system overview video. 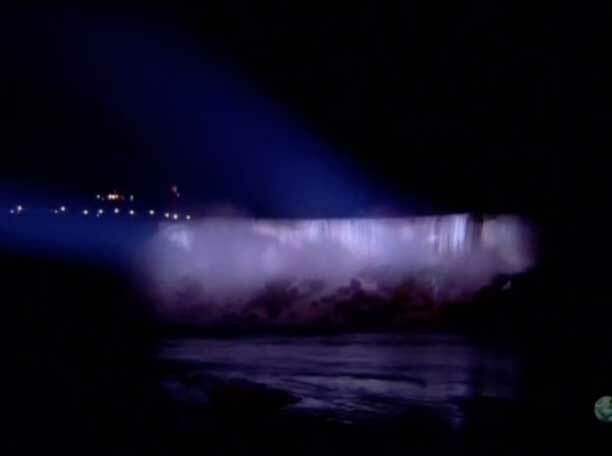 CBS News → Niagara Falls unveils new LED lighting system. 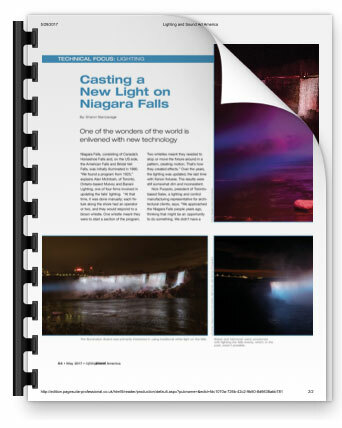 Salex → Daily Planet Documents Our Iconic Niagara Falls Illumination Project. Salex → Salex Illuminates an Iconic North American Landmark. 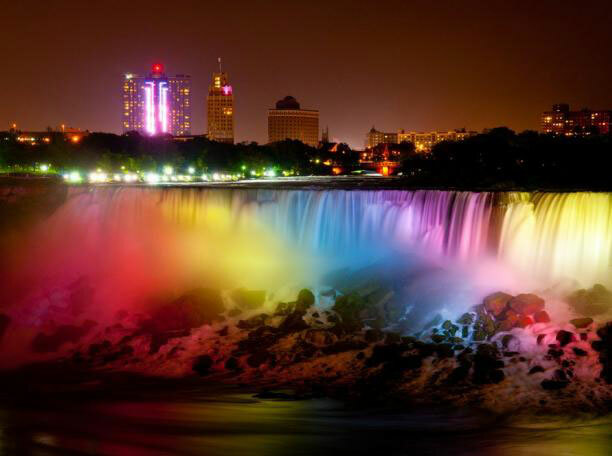 The London Telegraph → Niagara Falls' dazzling LED light display unveiled. Copyright © 2013-2019 • Scenework, All Rights Reserved.